Can you believe the I still have SO much more to share? Tomorrow the entire team gets together to post yet ANOTHER amazing gift ensemble using elements from the latest My Time Made Easy ™ LLC Release! Wait until you see her creation!!! Click HERE! Myself, the design team, and YOU the customers have just fallen in LOVE with Argyle Amazement ©. It is easy to see why! This is a background building set, unlike any other I have seen, that just like its name-is AMAZING!! Argyle is one of the hottest pattern trends right now! It is literally everywhere and I LOVE it. My girls especially have lots of clothing with the fabulous pattern. You will be totally amazed at how quick and easy you will be building backgrounds, or using this set as the main focus or accent over and over again. It has elements to make things masculine, elegant, clean, simple or whimsical. Scroll down on my blog the last week and you will see this set used on just about every project possible. So let me share a couple QUICK samples! I’m tight on time today. I have 3 samples specifically using the Argyle Amazement © set today, all with relatively similar layouts, but different color schemes to show you have it can go from Primary color WOW! 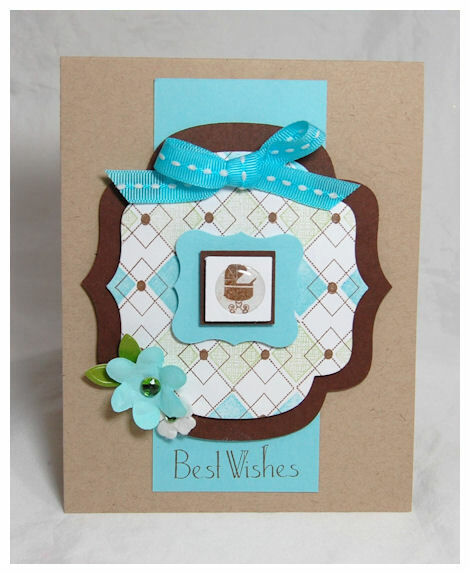 to muted monochromatic colors, to the soft pastels for a baby card. I used just the trio diamond flower pattern from Argyle Amazement, stamped on my cardstock in a staggered pattern, in chocolate ink. I then dusted off my copic markers to color it in! I had a blast. It actually came together VERY quickly. The main layer is cut with a circle, then layered onto a scallop circle. This color combination just warms me up! It is like the sun on a perfectly warm summer day. I love this sentiment &quot;Perfect in every way&quot;. I had to use the All A Flutter ©set to make it appear that they were flying around this summer argyle garden. Butterflies stamped in red, and colored with markers and a Copic Spica glitter pen for some POP! Then onto a darker, more muted combination. I LOVE LOVE LOVE the pattern this made! With all the options in the set the combinations, and color schemes are so endless. As you will see, if you scroll around on my blog, I used the flourish flower argyle A LOT! I am just in love with it! That pattern is actually the flowers in the Pretty Printables paper collections this month!! Too fun. I added the similar wing print in the cross pattern to the butterfly. The colors more monochromatic here . I defnitely think it has some elegance to it. I’m keeping the occasion options open on this one by leaving it blank. I love the pearl accents I added to the butterfly, ribbon and flower centers. In the bkgd I stamped a sentiment from the All A Flutter Sentiment set too. Sadly my lighting was a bit brighter than I realized, so you can’t get the full effect of the argyle :C Had I noticed how bright it was I would have re-taken them for my post today. Oh well. The pattern in this one is stamped in brown, and it has a crosshatched texture diamond in a celery, and a turquoise diamond in solid, alternating patterns. Really fun and easy. I used the little carriage that comes in the newly released You’ve Got Mail © set to make this into a baby card. SUPER SIMPLE! The sentiment is from a set named So Sentimental ©. It is NOT released yet. Just a TINY peek at what is coming. So that is all. Now you can see how one set using virtually the same layout can look so different. Make sure you scroll down to check all the samples that I’ve been posting. There is SO much that has been shared from today’s post to how to use the Cricut and SCAL as well as the awesome value in our Cut Files! I am hoping our gallery will be ready at some point. It is a lot of work and very time consuming. I want to ensure it doen’t have any glitches or CRASH if we have X number of people loading or accessing it. So hold tight on that. There will be a place we can all share our MTME creations soon. Soon I will do a tutorial for those of you who are SCARED to try the digital paper, and NEED to see how super easy it is, as well as why it is SO cool, or want to see the cost effectiveness of printing your own! So be looking out for that. Well I need to run. It’s Valentines week for the kids so I need to prepare all the supplies for them to complete their Valentine projects and class Valentines!! As I stated before I will share their completed projects. I have been “around”, just the kids have been keeping me busy! I know that is a common phrase I have shared on here the last 2 months….but it is getting better. As the hustle and bustle from the holidays wind down…and I get back to stamping all will be right with the world! WOW! What can you say to that. She can often have a hard time with her expressive communication (but she writes everything she thinks in poems and stories) so when you do “have a moment” to get in her head as to what she is thinking it is rare and beautiful. Granted that time heart wrenching, but nice to know why she may be so quiet. I told her that was a long time ago, and she is all better. We just need to keep checking to make sure she stays healthy. Her bottom line “I don’t like it there”. You know what? I don’t blame her one bit! I don’t either. We are coming up on our 4th year since she got Leukemia. Each winter, when we make that long drive I am flooded with the thoughts, emotions and memories of THAT day that she got diagnosed. I just can’t help but remember that day like it was yesterday. It is just like the day you have your children-unforgettable. I am so grateful she is doing so well now. Not a day passes that I don’t thank God for that. Not a single one. ESPECIALLY when she is being difficult! LOL! She is 10 now and lets just say the attitude could use an adjustment at times! LOL!! Through the holidays and my first release I was SO busy and consumed with everything that I needed to take some extra special time with my kids. Like I said I NEED to cherish this time that they are small (well I guess that is the point, they are getting SO BIG! SO FAST!) and that means some of my creative time has taken a back seat. Plus I really poured out the projects for the My Time Made Easy ™ LLC release!! The kids and I are working on some fun projects togehter that we will share soon too!! They missed me while I was busy getting everything all settled, and now I can slide back into a work routine and spread myself more evenly through my family, friends and work. I just needed that little break so the kid know that they are #1! 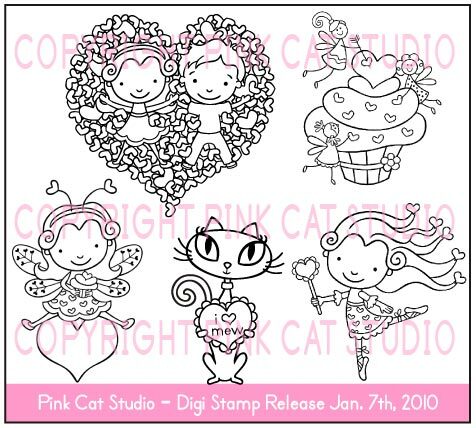 I have some guest spots coming up as the week ends, new releases for some companies to share……one being Pink Cat Studio! She released a ton of fun stuff so go to her store and check out her blog! The design team did some AMAZING stuff with it all! Pam made a STUNNING frame for her craft room for ONLY a $1—>HERE! Mona use Shutt-erfly © for a color challenge! Kristin as a few FAB projects too!! I think that is all for me today. We are taking the kids bowling, then I have some creative time. Sorry nothing to creative yet….but I’ll share soon. Additional info-it wasnt my website update it was USPS!! Hi everyone-Quick update! If you live outside of the US you will want to read this. If you live IN the US you can skip it. Up until today our shipping for International orders was working perfectly! People outside the US were able to get our stamp sets using the First Class option! Now that means it only cost somewhere under $3 to ship to places like Austraila! I promised no overblown shipping costs-you pay what we pay. That been said, we have been modifying our shipping software to speed up our order process, and with that came a bitty glitch! Somehow the “first class” shipping option “disappeared” for international orders, leaving only an expensive array of shipping options. We have found and fixed the issue! So if you are international go ahead and place your order! If you tried to order and noticed the shipping cost and left, it is now fixed. So thank you for your patience 😀 Happy Shopping!! I can always count on Melissa at Pink Cat Studio to come up with the CUTEST images. She is just the sweetest thing. I have missed using her stuff. I’ve gotten so busy….its just fallen to the wayside. But Lily is my FAVORITE so it was nice to se aside some time to just play. I knew I wanted to package up some candy in the In a Pinch © Pretty Packaging template. I also knew I wanted to use RED and some other non-traditional Valentine colors, so I got inspired by the heart paper, and added some flowers from American Crafts. Admittedly this was created during a MOJO lacking moment, and when I was completely exhausted. No excuses though, but now I’m thinking (with a clearer head and some creativity) I could have totally omitted the heart paper! LOL! Oh well…..
Be sure you go to the BLOG to see what all the team members have out together to get yourself inspired. Today is the kickoff for the peeks to begin for the January 2010 (<—-whoa! can you believe that! 2010!) release at All That Scraps. This month she is releasing 5 collections of images, all releasing on Monday January 4th. You will definitely want to check out the ATS BLOG each day until the release, to see samples from the design team, and enter for your chance to win the set featured!! Just in time for Valentines day……. This is Sweet Miss Rosalie. How adorable!! I love her, the outfit, flowers, and everything! I have had these CUTE metal buckets from the Target $1 Spot, for over 2 years now, and have been awaiting the perfect project. When I saw Sweet Miss Rosalie, I knew it was time to dust this bucket off, stop hoarding, and share the sweetness!! I used my blending paper to stamp, then color with my Copic markers, and I just had cut her out. Of course my 5 yo Amber, makes me find SOMEWHERE to add glitter, and the flowers were perfect. The perfect image deserves the perfect sentiment, so I had to pair it up with this NEW! 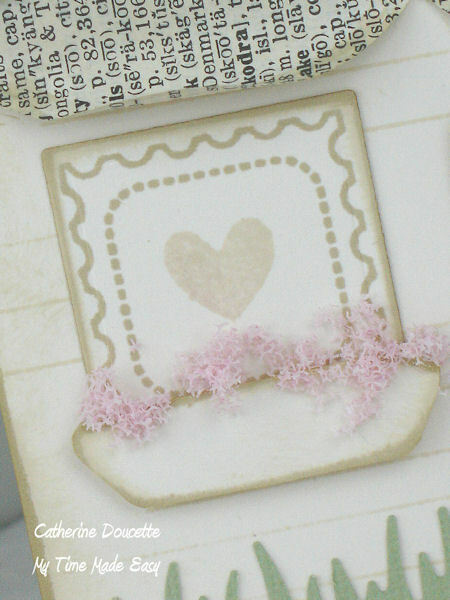 Romantic Sentiments set from JustRite Stampers!! I LOVED the sentiment, so I paired it with the image. This sentiment set is perfection. So many sentiments in one set, with some stunning borders. I loved the underlined heart in the sentiment, so I added glitter, again! I covered my bucket and added some ribbon and lace trim, in a unique sort of way. I wanted GIRLY and FRILLY, yet simple. I think I accomplished what I set out to do. So I hope you can stop by tomorrow for more ideas and samples!! OK everyone, here is the scoop! My Time Made Easy™ LLC is now currently down for “maintenance”. We are actually moving our website to a new host and are working to ensure we can correct everything. Our service people have escalated our case to a top priority, so we are hopeful to have everything all set for tomorrow. Keep in mind this move is out of my control, and the time-line is in the hands of our web-server, who needs to ensure NO DATA is lost. Now I know while the site is down you cannot access anything, and I apologise for the wait, but we obviously want this to be perfect, and given the fact our previous web-host couldn’t handle all your amazing My Time Made Easy customers, we have to make this switch. Obviously we want everything to be working at optimal speed and have little/no glitches!! This will mean your downloads will actually happen quickly, pages won’t pause, and every other glitch we have had due to our site being throttled, will be resolved. If you ordered you will be able to download your PAID for files once we re-open. We will be resetting them for you. You will have 5 chances to download any file types. Obviously there is NO shipping charges applied to any file downloads. You may have to “re-order” the FREE files since we will reset them for everyone, as this is by far an easier/quicker fix rather than manually resetting FREE orders placed. IF you ordered the WRONG “paid for” file type, I will later have instructions for you to fix it. If it was the wrong freebie file, you can simply re-download, once we re-open. Please be aware the you are responsible for ensuring you order the correct file type. Our coupon code will be working for those of you whom received the newsletter. If you signed up for our newsletter but did not receive it, please make sure you checked your SPAM folder, and confirmed you wanted to receive our newsletter. You may need to update your profile. AND…. one last thing….due to all our glitches, and your response to them with patience and such a warm welcome into this business venture, we will be offering ONE MORE surprise freebie, sometime this week, after everything is settled down! Again, I do have samples, but since you cannot actively pursue use of any of the items in our store yet, I will wait. OK back to getting things squared away. Once again I appreciate your understanding as we transfer our host and fix any/all issues. Pleas do NOT use my personal email address for customer service/store related issues, as the store email is a separate email that I am checking far ore frequently than my personal email. Also please do not contact any of the design team members for customer service issues. They are not equipped/responsible for any customer service issues, and do not have any access to information needed to deal with any/all issues. I have personally responded to anyone sending an email to the store, and have done my best to update you. OK I think that covers it for now! There is one word to describe the response to the unofficial opening of my new store My Time Made Easy LLC-INCREDIBLE! So incredible that it has caused some major issues! As you are aware I’m sure. Now you may be wondering what that means exactly. Without getting into all the technical stuff……since about 7:45 am yesterday our Web Host had our store on “full throttle” , which is some sort of extra support, just to keep it RUNNING and NOT crash. We had our issue upgrading to a “level 3” where it was determined the Web Host simply doesn’t have enough power to host us! They said our traffic (after 9 hours of being open) hit #5 on the list of every store they host! They asked “What on earth are you selling?” The response was of course…” Well, gift packaging templates and stuff like that.” He was REALLY shocked and said “ALL that for some boxes?! Are you expecting this sort of traffic often?” and our reply “I hope so”. I guess we should never underestimate the power of our fellow papercrafters! LOL! This info all lead the what comes next…. So yes, the site is obviously slow, downloads have been SLOW (this is NOT normal), sessions timing out, and other glitches as mentioned before occurring because the info isn’t being retrieved. Some of you can’t log in, and that is because we are fixing things. We are fixing all the issues now so you will get any download you have attempted to receive. We may go “under construction” so everything gets fixed quicker. That means shutting down for a limited time. SO once that is all set ,this means we will be moving servers! That means that in time for our official release things should be smooth and FAST. This “unofficial opening” was a very good thing because we are curbing any/all issues. Now we will obviously extend our download time, our sale and coupons! So no worries there. We just need a day to get this all straightened out. I have some samples but right now would need to focus my attention the the website stuff first. Long time no chat huh? You will SOON see why! It will have been well worth my silence I promise you. My store —-> HERE<—– is ALMOST live! So close I’m hyperventilating! LOL!!! Words cannot express how excited I am for this. I have my newsletter written …..with the SECRET Coupon Code for my email subscribers to get a FREE Pretty Packaging template(for a LIMITED time) and have my post ready with my first samples with my templates and announcing my design team. To say I’m excited is a complete UNDERSTATEMENT! Better yet, all my stamps will be arriving sometime next week. Our very first “official” release looks like it will be scheduled for January 3rd. Ill keep you all posted! If you haven’t you may want to sign up for the newsletter! Check your SPAM folder for a confirmation email if you don’t get one in your IN BOX.